Our Neck of the Woods: Pollen-Bound Hive? Upon an inspection of the beehive a few weeks ago, we noticed there was very little brood and we couldn't find the queen. We were really worried that we may have killed her somehow (every first time beekeeper's worst nightmare). 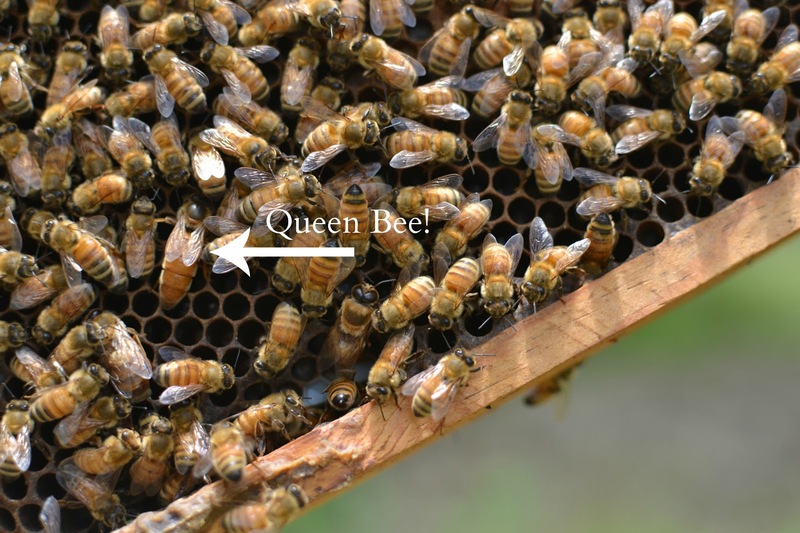 David was making arrangements to buy a new queen ASAP so our hive wouldn't be too affected by her absence, but before we jumped the gun we contacted a few experts for their opinions (thanks for all your help, Natalie!). We decided first of all to conduct a very thorough search of each frame to make absolutely certain that we did not have a queen before buying a replacement. And what do you know, we found her! We were so relieved once we spotted the queen, but still worried about the lack of brood. During the summer when they are foraging nonstop, worker bees only tend to live about six weeks. They basically work themselves to death. If the queen hasn't laid any new eggs in a while, the hive population could drop drastically in a short period of time. So this led us to do more research on why our queen would not be laying up to her full potential, and we reached the conclusion that she may be pollen bound. Many of the frames were so packed with pollen (and also honey, but not as much as pollen) that it seemed the queen had nowhere to lay her eggs. David figured we should switch around some of the frames, moving some that were still somewhat empty over by where the queen was hanging out. By giving her some frames with space to lay eggs, we hoped she would ramp up production. While I was at work yesterday, David opened the hive to take a quick peek and noticed a lot more brood. Success! We caught the problem fairly early on and were able to solve it with a little research and following our instincts. So far there has been such a steep learning curve to this whole beekeeping adventure (which I fully expected) but I'm glad we are learning so much about them. After all, if everything went perfectly, we wouldn't learn much, right? At least that's what I keep telling myself! That frame David is holding in the first pic looks GREAT all covered with bees like that!!! Your bee population looks very healthy, and that's a nice fat queen you've got there. :) You did the right thing. I used to worry about killing the queen every time I went in the hive, for at least the first year! :) You will get less anxious about that as time goes on. She's not as fragile as they like to make new beekeepers think. Do be careful that she's not on the inner cover when you take it off. She can show up in some whacky places!! I extracted about 90 lbs of honey today. You will have a ton of fun the first time you do that! I also felt better after I was finally stung a couple of times (which didn't happen until year 2!) It was never as bad as I feared, and once I knew I could be stung and not drop a frame of bees I was holding, I felt pretty confident. I am very careful about wearing a veil, because I don't want to get stung in the face or eyes. My mentor sometimes goes in without a veil, which is why he got 12 stings in the forehead the other day! He just laughs it off. Actually, I just laugh off stings now too! The day one gets my armpit, I won't be laughing. glad you're having successes as you learn! My OH would love to keep bees on the farm but I am not brave enough. What a wonderful journey Tammy. I can't believe you actually found her in that massive group of bees! Good eyes and I'm loving your journey! Cool stuff! Beekeeping is so complex- I bet it takes a while to get the hang of it. I would have no clue but but I think your bees look great! I have to agree, long live the queen! I am so happy there was a happy ending and all is well. Great photos. This is so interesting! I am learning some about bee's through my friends that are in their first year of bee keeping as well. They had their first swarm this past weekend. I haven't talked Cliff into raising bee's yet, but I hope too! Your pictures are amazing! And look at all your bees, they look like they're doing well. Glad you found the Queen, it can be a little rattling when you don't see her. We paid a little extra for a marked Queen, it makes it a little easier to spot her! Keep up the good work! What an adventure! That queen would be hard to find. Glad you got the problem figured out before you lost the hive. I never realized it could be so complicated. Glad you found her! Glad you found her! I think that this is so interesting and I love reading your posts about it. It sounds like you two are doing great! I'm so glad you found the bee (that doesn't look like an easy task) and figured out what might be wrong. Good for you - learning so much as you go! Tammy this is so impressive: you're so fortunate. I saw in a movie that a queen bee has to be killed if it's not productive. I wonder if that's true. Thanks for replying. This is so fascinating. Very interesting! So glad your queen is alive and healthy too...glad you were able to find a simple solution to the lack of brooding. With the decline in honeybees, your hive is a great asset not only to your garden but to the whole ecosystem as well. Thanks for raising them!! You're learning and sharing so much, keep up the good work! Yay for a happy ending!! This is such an interesting adventure for the two of you! Thanks for sharing it with us! We so want to have honeybees, but it seems so intimidating to me. But I think we'll probably do it anyway! :) Glad that everything seems to be correcting itself. Thanks for 'visiting' always enjoy your blog! Oh my!! That's like looking for Waldo! Your bee hive looks like everyone is happy and doing their jobs!! Wow, I didn't realize there was so much to know about beekeeping. You and your husband seem to be doing a great job. I'm learning lots from your blog. I'm glad you found the issue right away before it was too late. There sure is a lot of work involved, but I'll bet it is rewarding! Very interesting - who would have guessed!! Pollen bound? So much to know!! :) Happy it worked out. Good work! I just love reading your beekeeping posts--I always learn something! I really enjoy keeping bees and there is always something to learn! The balance of nature is so delicate. Good job - you guys are solution-oriented, and it paid off! what a scare, glad you found her! So cool - we are REALLY bad at finding the queen and often just go on the state of the brood, honey, etc. Very interesting. I know nothing about all this. Glad to hear you likely solved the problem. Interesting Post Tammy that must have been a scare for you both..So happy you found the solution I've learnt something today. Hope they keep well and flourish you are a star. It's fun to follow your journey, Tammy! What a task it must have been looking for that queen! I'm glad you found her. Can't wait to hear all about extracting the honey but oh well, I know it takes some more time.